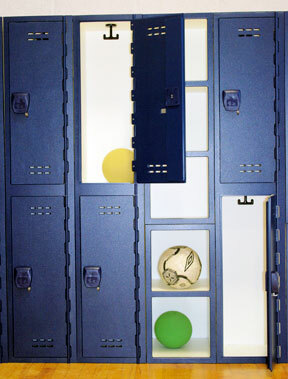 Why Choose Solid Plastic Lockers? While steel is a common, economic and versatile material, solid plastic lockers have inherent advantages in many environments. Our lockers are made from High Density Polyethylene (HDPE) which is abrasion reistant, offers excellent impact resistance and has high tensile strength. Our innovative one-piece body uses no mechanical fasteners or hardware. Body joinery is done using full length dado joints secured by continuous plastic welds. 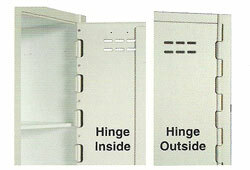 Even the hinges are designed without steel rods, which can pit and corrode when exposed to the environment. Why Choose Royal Plastic Lockers? All doors and frames are made from solid 1/2" thick HDPE plastic made from polymer resins formed under high pressure in the color selected. The surface has an attractive textured pattern which reduces marring. sides, shelves, tops and bottoms are made from natural white HDPE with a uniform matte surface. Whether 1-tier, 2, 3, 4, 5 or 6-tier, all lockers share the same characteristics listed below. Lockers can be fastened together with tamper resistant fasteners to form groups or rows of any length! Our Hinge Design! We manufacture our own solid plastic hinge that under the most extreme moisture, corrosive chemicals, or dry heat conditions will not fail. 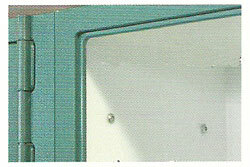 We chose not to use metal hinges like our competors basically because they will fail under the above conditions. It has been my experience that metal hinges almost always end up squeaking, binding or generally breaking when exposed to severe conditions and simply put ....Our Hinges Don't! Our Latch Design! Our latch is clean with no visible mounting hardware. The sliding movement of our latch is accomplished by half of the slide being machined into the underside of the latch bar and mating half machined into the back side of the door. Mounting the latch this way makes it extremely strong because there are no fasteners to break or fail. We also feel that because of the above methods the mounting slides are hidden and therefore tamper proof. Our Handle Design! Handle design. We wanted our handle assembly to be able to move vertically and feel like it was riding on bearings. So we did just that and designed a plastic sleeve bearing that rides a track in our latch bar and eliminates the friction normally generated by flat surfaces forced to slide against each other. This also allows us to be ADA compliant. We also designed our handle to work independently of the latch bar. This will provide added strength if a door if a door gets slammed shut in the locked position. Usually when a door is forced shut while locked an excess amount of stress is exerted on the frame and the latch bar. By allowing our latch bar and handle assembly to work independently we eliminate that stress by allowing the latch to slide around the frame and lock. The door is lockable with combination or key padlocks for secure storage using a stainless steel hasp. Doors can be made to accept other locktypes on a production basis. Door strikes are on the top, bottom and full height of every door. 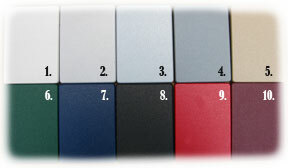 Lockers are available in 10 standard colors listed below. Nearly any custom color can be created to match your specific requirement. Note: the colors in the image may not match the actual colors due to display differences.